Any undergrad business major can intuitively point to the need for strategic planning. Organizations have limited resources, so establishing a plan for what needs to be done, by who, and when given a series of internal and external realities and constraints only makes sense if goals are to be achieved and stakeholders satisfied. Despite its importance however, few companies have cracked the code on strategic planning. For many, the process is akin to a black hole. Meetings occur, informal discussions take place, and then, somehow, magic happens – a three ring binder appears, supposedly summarizing the decisions agreed to by the leadership team. Unfortunately, that’s typically where the magic ends. More often than not, the document is rarely reviewed, seldom consulted, and is left to languish on a credenza till next year. 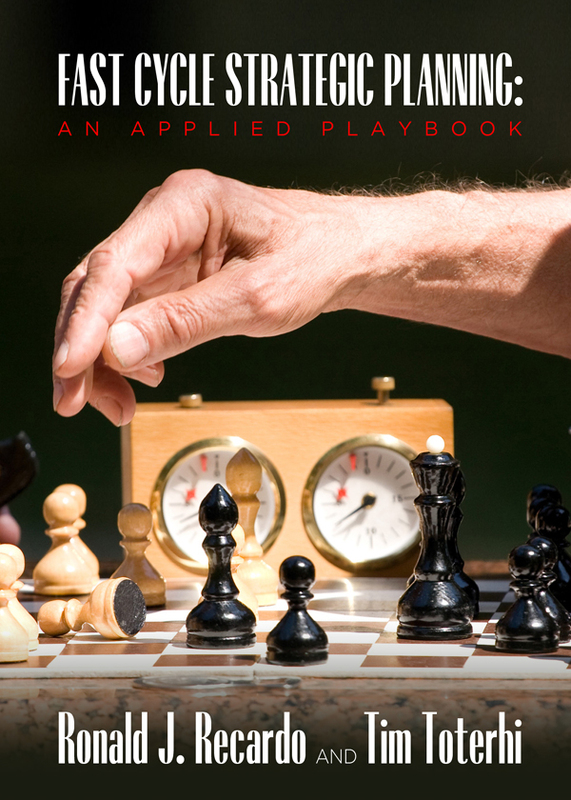 Fast Cycle Strategic Planning: An Applied Playbook is a book to end the madness. Fast Cycle Strategic Planning provides readers with a practical, comprehensive playbook for creating a strategic plan. Each phase of the process – Environmental Assessment, Internal Capabilities Assessment, Strategy Development, and Strategy Deployment – is described in real-world, practitionare language. Easy-to-follow process maps are provided for each phase with descriptions of specific tasks required to complete them. Most books on this topic focus solely on theoretical frameworks and conceptual models, take a purely academic view of the subject, or rely on an approach endorsed by a single “ideal company”. While this has some value, generic models and classroom inspired case studies rarely hold up to the rigors of the real world. And though it’s true that some companies have obtained success in strategic planning, there is no guarantee that their approach will work for your organization – there is no sliver bullet! What makes Fast Cycle Strategic Planning unique is that it was written by seasoned practitioners who have applied the tools in a variety of real-world, corporate settings. In addition, the methodology is scalable to different sized organizations. The content is not a repackaging of materials already in the public domain but represents new thought leadership. The playbook was developed from research projects The Catalyst Consulting Group, LLC has sponsored on strategy development and execution, includes strategic planning best practices, and incorporates learning’s from the over 200 client companies our consultants have worked with over the years. Regardless of your company’s size, complexity, offering portfolio, or geographic scope, Fast Cycle Strategic Planning will help your organization analyze its external environment, reach consensus on your sources of competitive advantage, identify a business strategy, and execute it seamlessly. You can purchase the book online from Amazon or Smashwords in multiple eBook formats at https://www.smashwords.com/books/view/368399.